Home Local News WATCH! 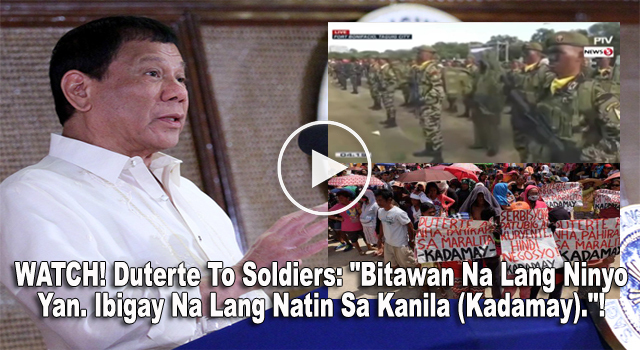 Duterte To Soldiers: "Bitawan Na Lang Ninyo Yan. Ibigay Na Lang Natin Sa Kanila (Kadamay)." WATCH! Duterte To Soldiers: "Bitawan Na Lang Ninyo Yan. Ibigay Na Lang Natin Sa Kanila (Kadamay)." However, the President promised the police and military personnel that he will give them better ones by December. "I will ask you soldiers and policemen, bitawan 'nyo na lang 'yan, ibigay na lang natin sa kanila kasi mahirap sila," said President Duterte during the anniversary of the Philippine Army. Around 4,000 urban poor residents have taken over vacant housing units in resettlement sites in Pandi, Bulacan since March 8. The units have been unoccupied for 5 years, and Kadamay said the government should just give them away for free. Duterte said he would ask the National Housing Authority (NHA) to look for suitable land for the "bigger" houses to be given to police and soldiers. "I will look for other land nearby, or contiguous to the area and I will make better ones, with water and electricity," President Duterte said. The President got the assurance of the NHA that it has enough funds for another housing project. Duterte promised to personally handle it. "I will personally go there to supervise your housing project... I am making you a commitment and I guarantee that you will have yours," said Duterte. Sponsor He asked Kadamay not to be violent against the police and military who are now in the housing complexes in Pandi to secure them at the request of the NHA. "'Yung mga Kadamay nandiyan, huwag ninyo galawin 'yung sundalo at pulis kasi paalisin ko kayong lahat," said Duterte. The cops and soldiers who had been allotted units were given until May 30 to decide if they agreed with the decision.